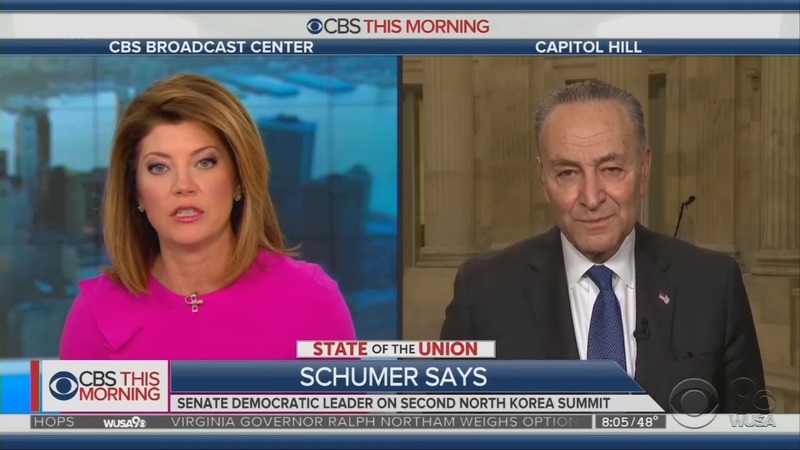 As Senate Minority Leader Chuck Schumer appeared as a guest Wednesday morning to give the Democratic point of view on President Donald Trump’s State of the Union speech,CBS This Morning co-host Norah O’Donnell essentially repeated the Democratic argument dismissing the severity of illegal border crossings as she invited him to respond as opposed to balancing out the discussion by pressing her guest from the right on illegal immigration. Instead of merely repeating the Democratic position to her Democratic guest and if she actually wanted to inform her viewers and give a balanced presentation, it would have made more sense for O’Donnell to point out that, over the last several years, there has been a substantial increase in the number of Central Americans, including children, who cross the border illegally. She also could have noted that U.S. law makes it a longer process to house and remove those who do not qualify for asylum. In past years, it was mostly Mexican nationals who were crossing, and it was easier for the U.S. to return them to their home country. Not surprisingly, these critical points were not brought up by Schumer or by any of the CBS anchors involved in the interview.